Cal Cases is an intentional community found in central Catalunya. It's home to about 30 people, all brought together by a common vision of communal living outside of the materialism and contradictions of mainstream society. 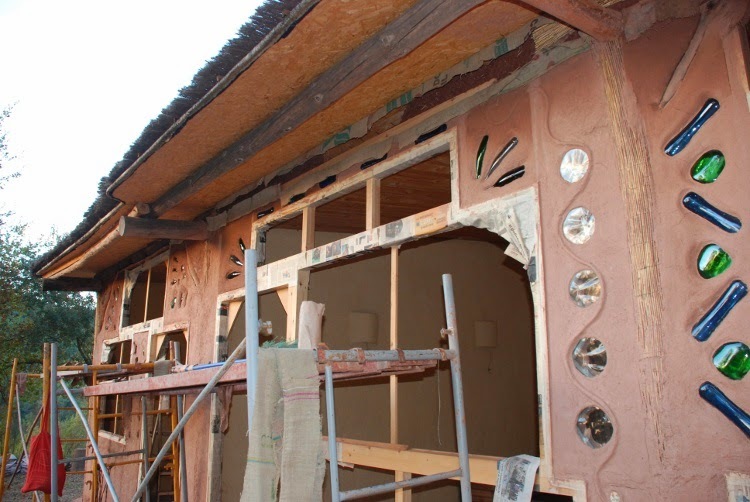 In 2010, I had the very good fortune to work with Cal Cases on the construction of a large timber framed straw bale building, divided into four apartments to house members of the community. 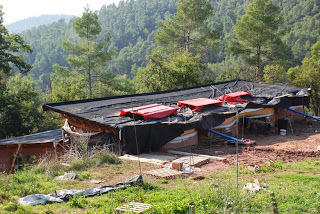 Like Cal Cases in general, the building project was very large, spanning 2 years, and the community was careful that their values were constantly manifested in the project: from the bales of spelt straw harvested from their own fields, to the natural round timbers felled in the neighbors' forest, to the countless tools and building materials that were either salvaged from the dump or donated by friends and supporters, the straw bale homes at Cal Cases became a monument to the common vision of sustainability held by the community. 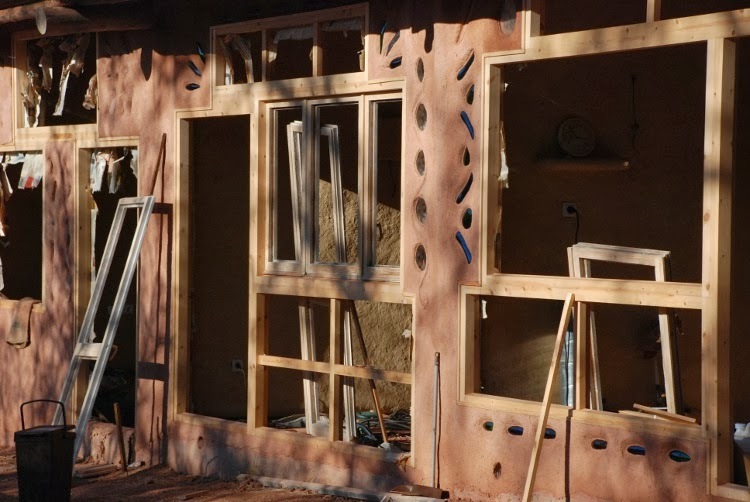 This post describes the second half of the Cal Cases straw bale home project. We were just about to start installing the green roof! 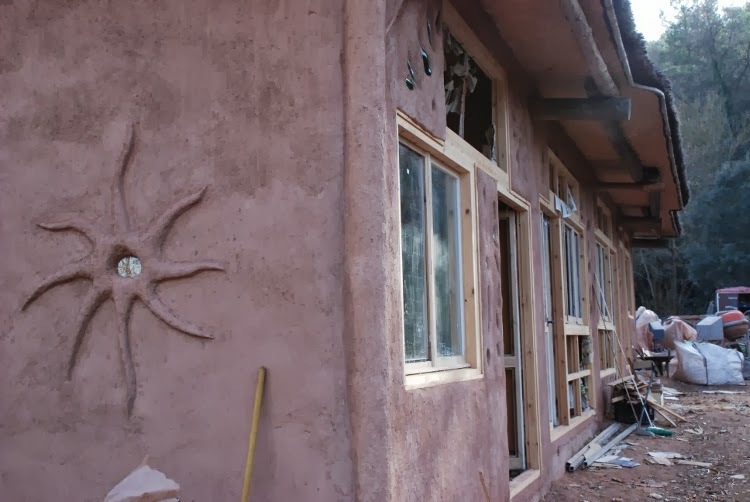 To learn about the first half of the project, you can read the post Building a Straw Bale Home: the Cal Cases Community. 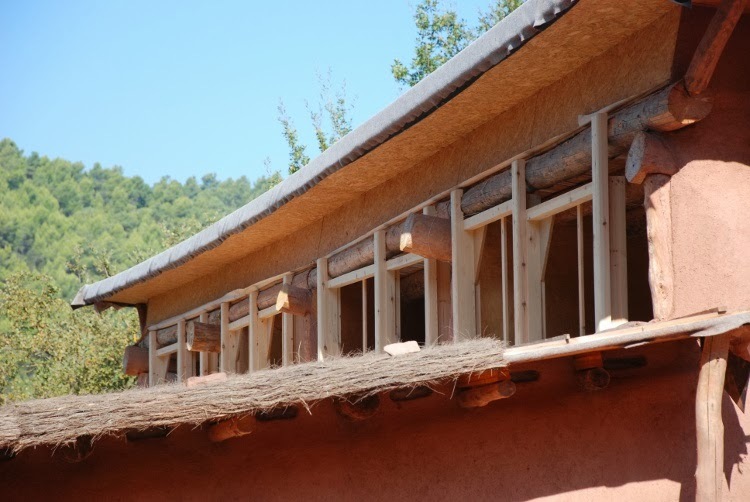 The north-facing roof was destined to become a green roof, insulated with straw bale. The ceiling was installed over the rafters, leaving the rafters exposed below. This made decking much easier. 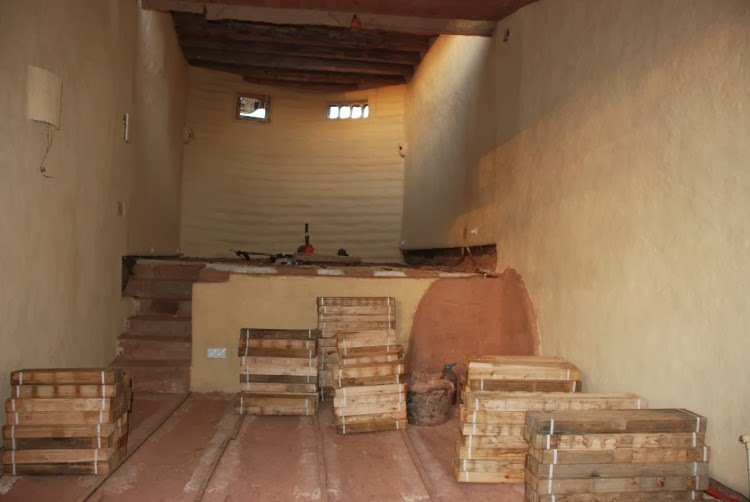 The roof was to be insulated with straw bales, so we built up a box around the perimeter of the roof tall enough for the straw bales to fit inside. You can see the three skylights have been fitted out with boxes around them as well. 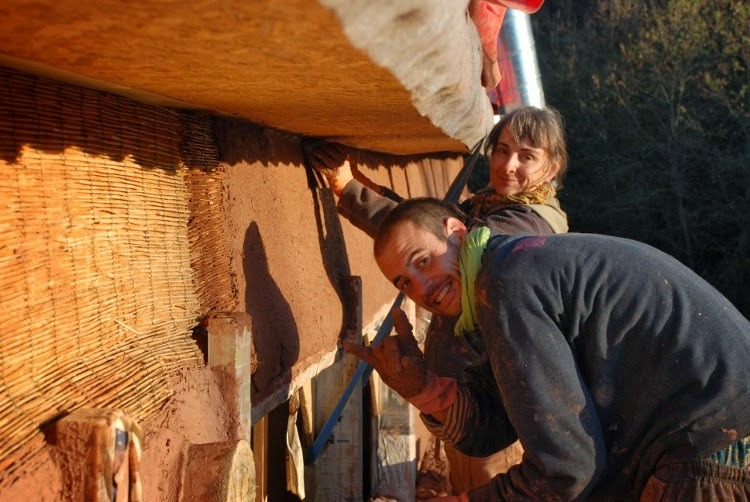 Then off of this box we extended the eaves of the house – an important feature for a straw bale house with earthen exterior plasters. Our eaves were three quarters of a meter, to be on the safe side. 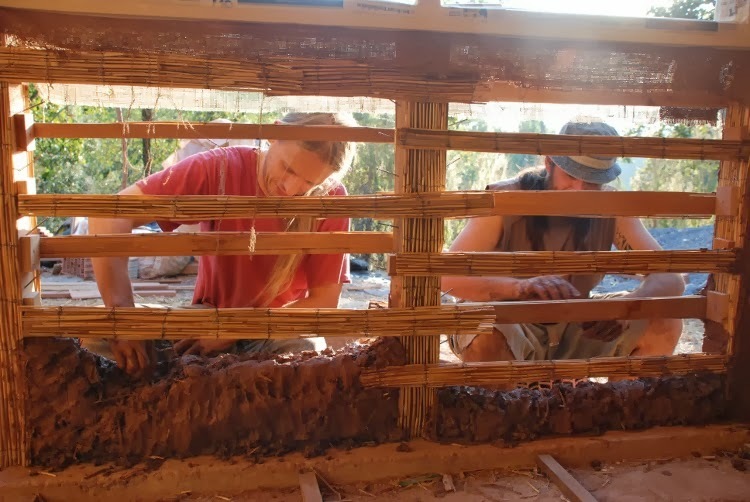 And then, finally, another box needs to be built on the edge of the eaves, to contain the growing medium and plant life that's going to be living up there. This final plant box doesn't need to be very high, only enough to contain a bit of topsoil or growing medium. Ours was about 3.5 inches. 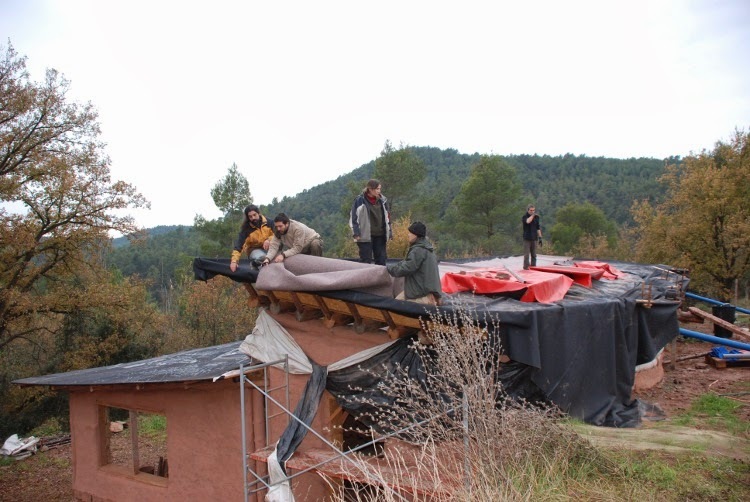 Once the bales had been loaded into the box, we covered the roof with felt and installed the bituminous membrane, folding it over the eaves of the roof and stapling it underneath, like we did with the south-facing roof. 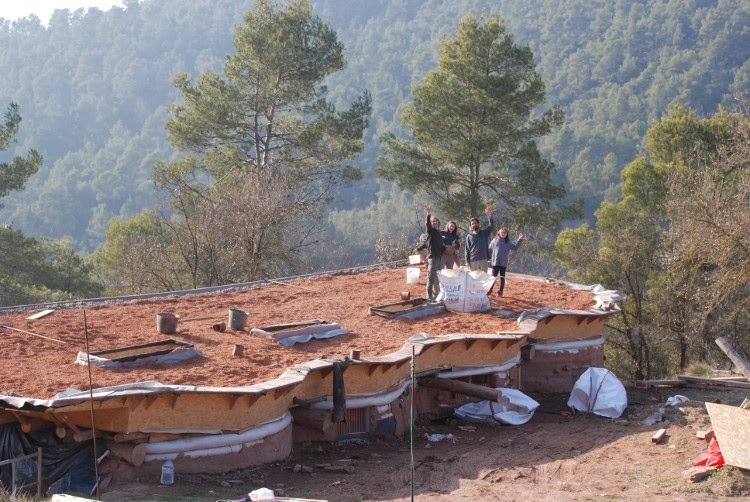 With a green roof it's extremely important that the waterproof membrane forms a seamless layer over the roof. It's going to be exposed to lots of slow-moving moisture, lots of weather, and also lots of plant roots, probing for some sort of crack that they can grow into. This is why it's important to choose plant types for your green roof that don't have potentially dangerous roots for the membrane. 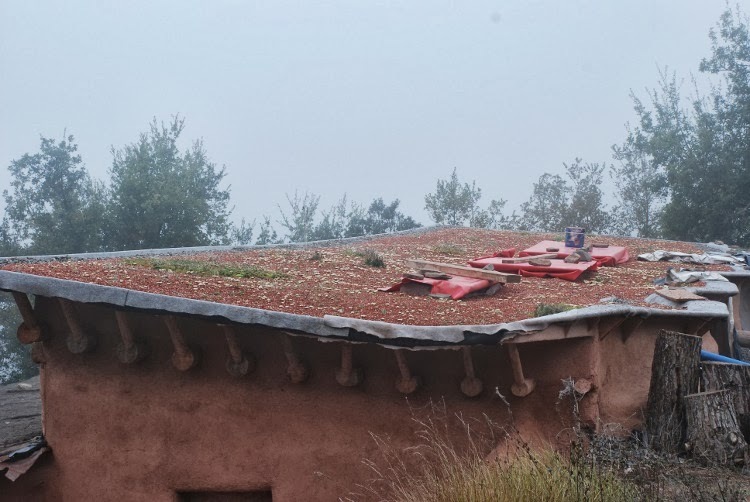 One other very important detail in green roof construction is the installation of a drainage system: we want to hold our plants and soil on the roof, prevent water from leaking into the structure, and at the same time allow the plant box to drain excess water. 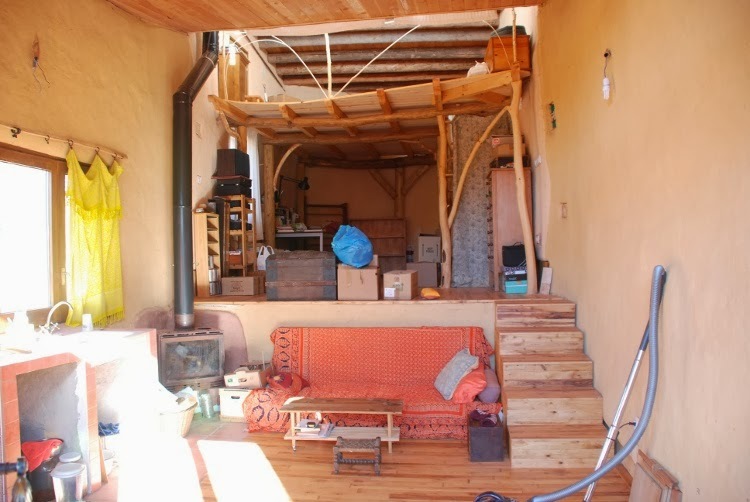 To achieve this, we framed a gutter into the roof that would be a gentle dip in the plant box. We graded the bottom of this gutter with sand to be sure that it would drain to the two downspouts, seen in blue in the photo above. I'm getting a bit out of chronological order here, but I'd like to cover the whole process of building the green roof while we're on the subject. The bitumen was covered with a layer of felt, and red lava rock was added for the growing medium. 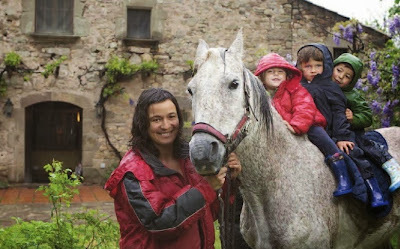 Lava rock is commonly used with green roofs because it's more lightweight than soil, helps retain moisture (a big plus for a green roof, which doesn't have access to a lot of moisture), and reduces soil temperature in the summer (another big plus in Catalunya). 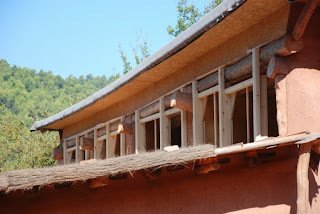 Once the green roof was watertight, it was time to plaster the straw bale walls below. 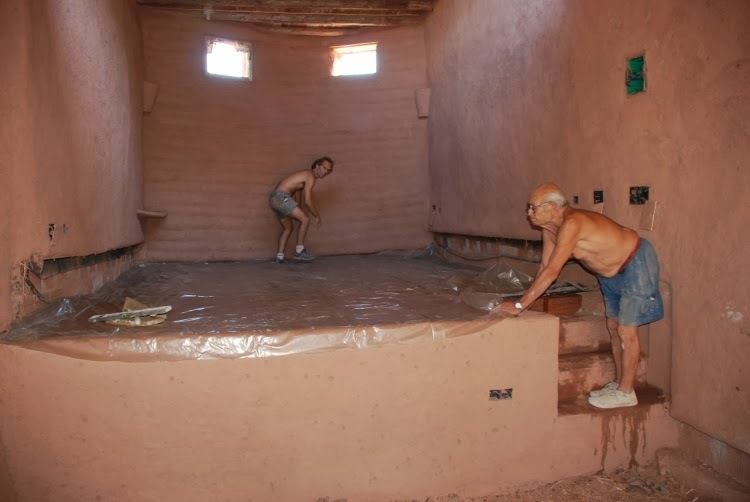 But before plastering could begin in earnest, there was a bit more prep work that needed to be done. First, in the above photos Iolanda can be seen wielding a weedwhacker while she trims the walls. This ensures the walls are as uniform as possible. 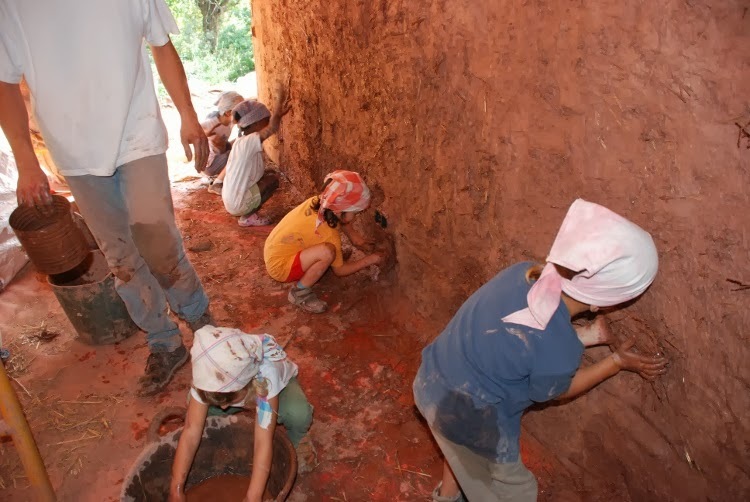 Then any cracks in the walls were patched with a coarse cob mix of clay-rich subsoil and lots of long straw. 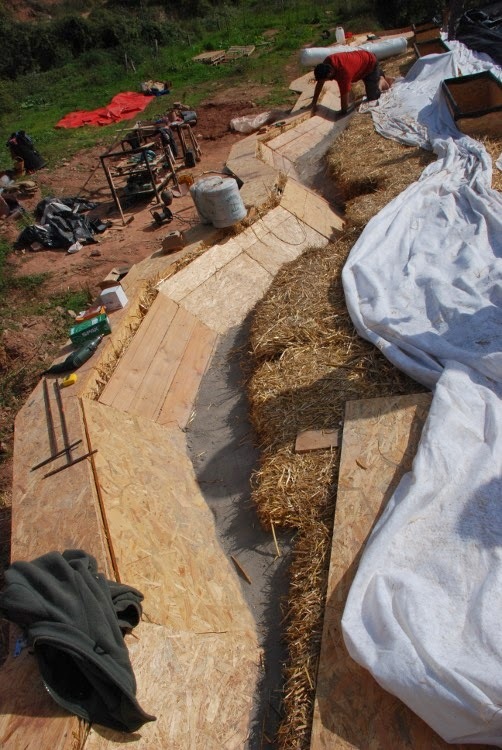 The photos above show the preparation of our clay slip, which is applied to straw bales before plastering can begin. First we mined our clay-rich subsoil out of the hillside, sifted it very finely, and then mixed it with water at a ratio of 1p subsoil to 2p water. Then we used our pressurized tank described earlier to spray the slip onto the bales. It's important to spray the bales with force, so that the clay slip penetrates well into the bales. This ensures good adhesion between bales and subsequent plaster. Next we prepared the “fat mix”, the earthen plaster we would be using for our scratch coat and subsequent brown coat. Our clay-rich subsoil was sifted and mixed with water. Then straw was chopped and kneaded into the mix by foot. 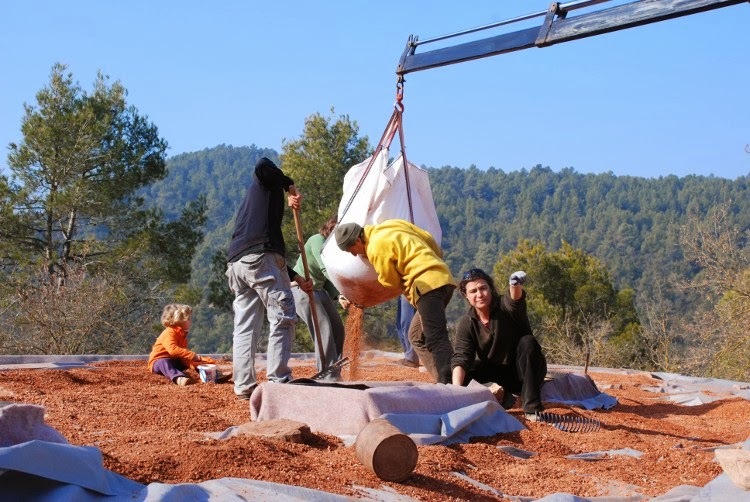 We had teams of volunteers preparing batches of the mix constantly, and it was stored under tarps until we were ready to use it. Although the fat mix could be used immediately, traditionally it's left to ferment for up to 5 days. 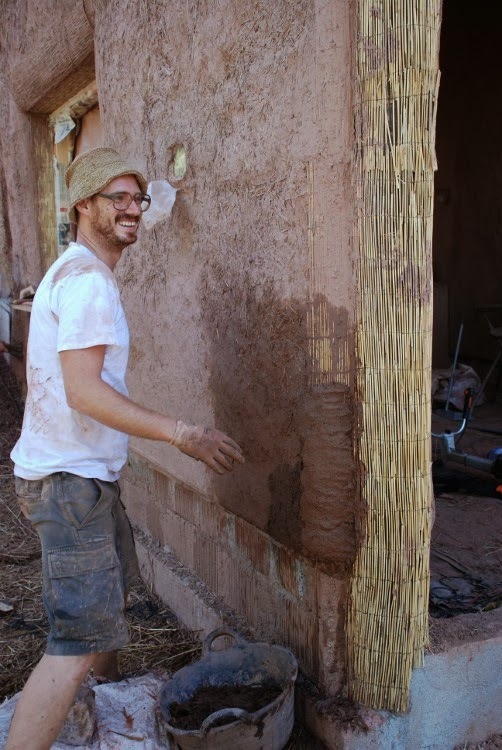 This allows the clay to really penetrate into the straw, making a stronger plaster. You can tell when it's really ready based on the smell. Corners around doors and windows, as well as places where more than four inches or so of wood is exposed, need special attention. We used reed matting and burlap sacking, stretched over the sensitive areas and stapled in place. This creates a continuous surface with good “tooth” that the plaster can key into. 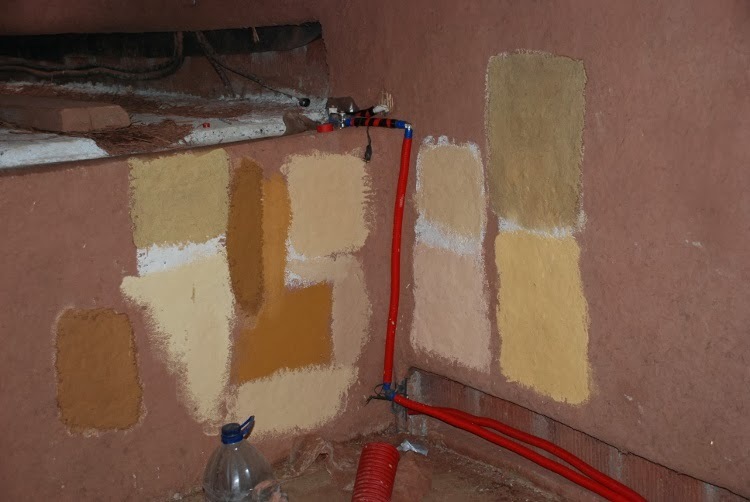 The photo above shows the test patches for the finish plaster drying on the east wall. Having the patience to test out different mixes is a crucial and often overlooked step, especially with the finish coat which is going to define the final texture of your wall. 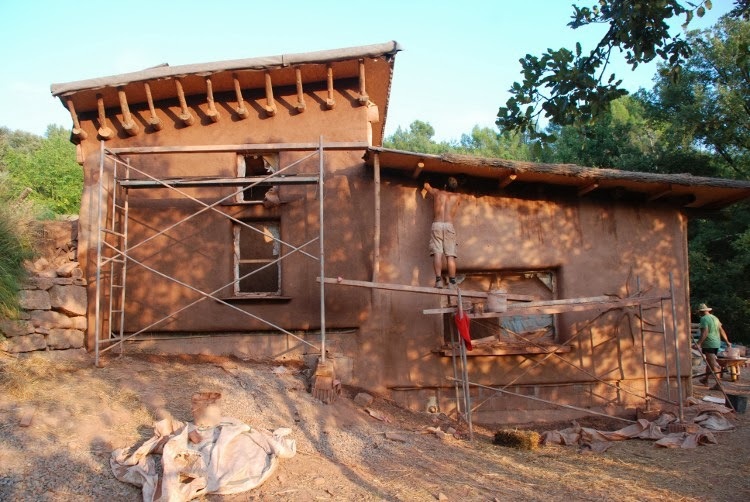 For the exterior finish coat, Cal Cases kept the original color of their subsoil, without adding additional pigments. Subsoil and sand was finely sifted, and straw was chopped very fine and added to the mix. 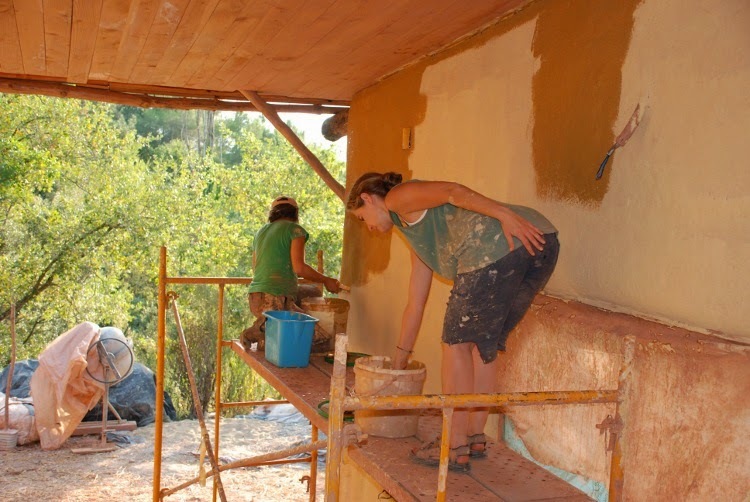 10% lime was added to the finish plaster for the North, East and West walls, because they would be more exposed to the elements than the South wall. 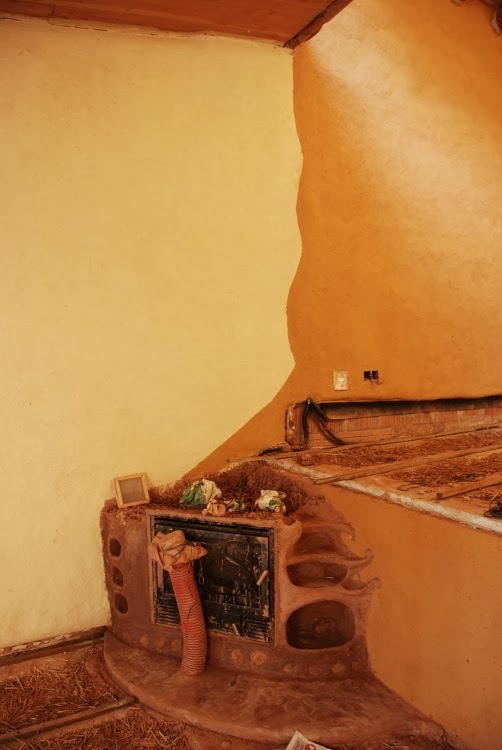 The interior walls were painted with clay-based paints, called alises. 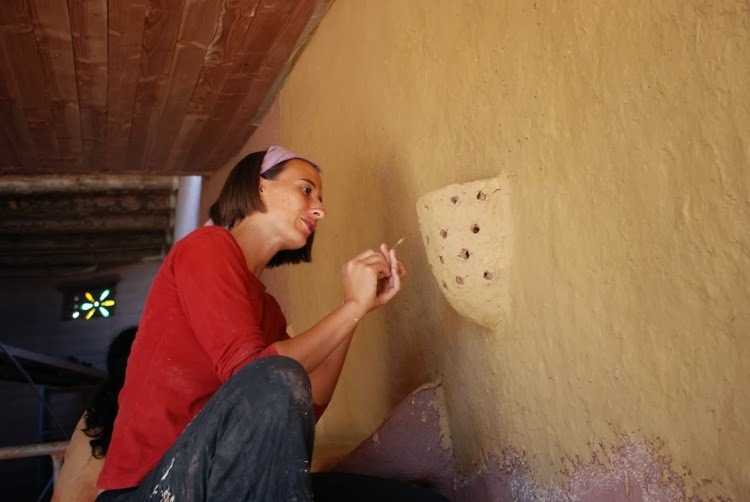 Some of the walls were painted with a simple alis, while others contained wheat paste, an additive that strengthens the paint and prevents chipping or dusting. During this time, professional natural builder Rikki Nitzkin visited Cal Cases to hold a series of natural painting workshops. She was a great help to the project, having visited multiple times to see the progress and offer advice during the 2 years of construction. 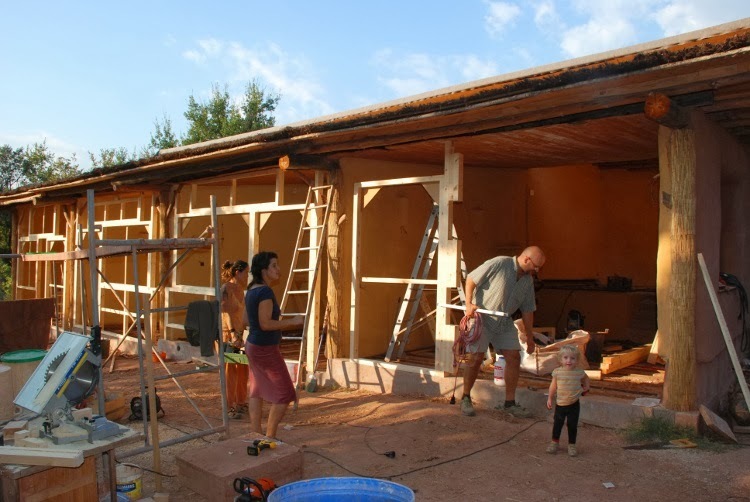 Her book, "Casas de Paja: Una guia para autoconstructores" was our main reference book throughout the build. 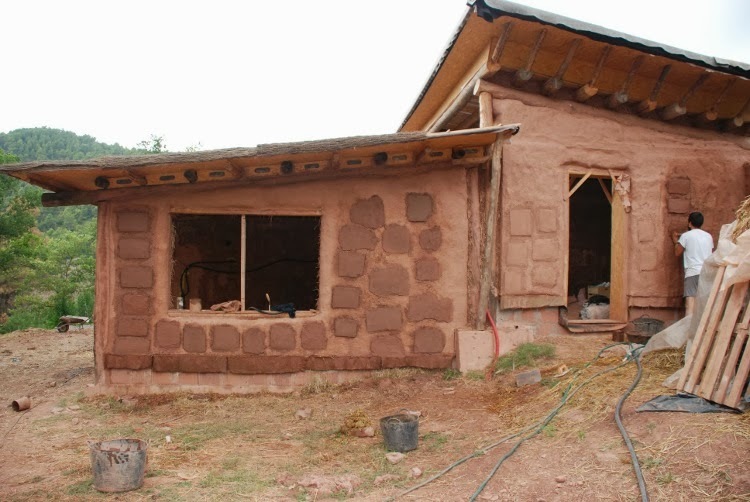 This book goes into immense detail, describing all the steps at a practical level for the building of a straw bale home. At the end of the second year, the project was finally approaching completion. 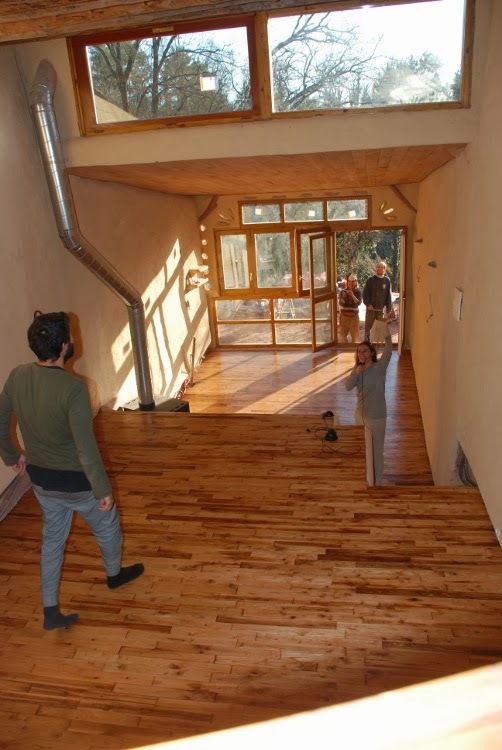 All that remained was the south-facing cob walls, installing doors and windows, the wooden flooring... and the final housewarming party! 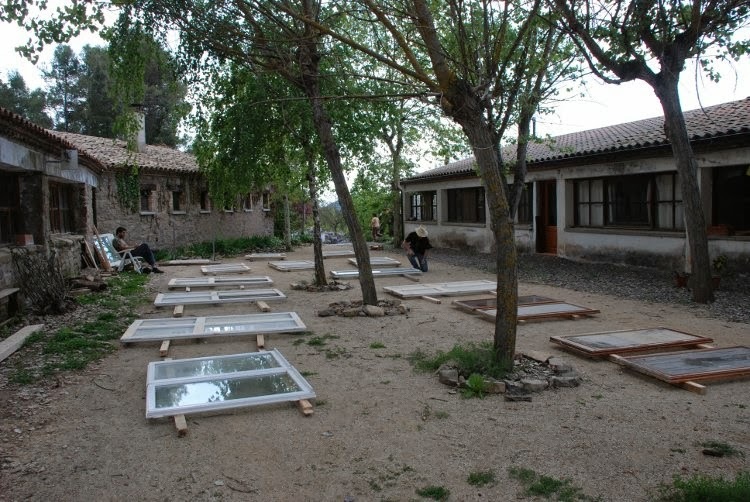 The doors and windows had all been salvaged, and thus were in need of refurbishing. Frames needed to be made for them as well. 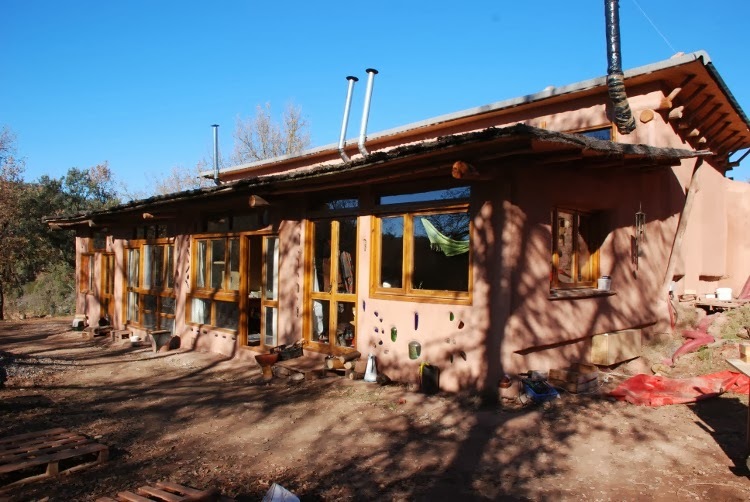 The south-facing walls were to be home to almost all of the windows of the building, to make the most of passive solar heat gain in the winter months. The photos above show the framing of the doors and windows in the south-facing walls, including the clerestory windows above. The south-facing walls were built with cob, which makes good use of the sun's heat due to its thermal mass. 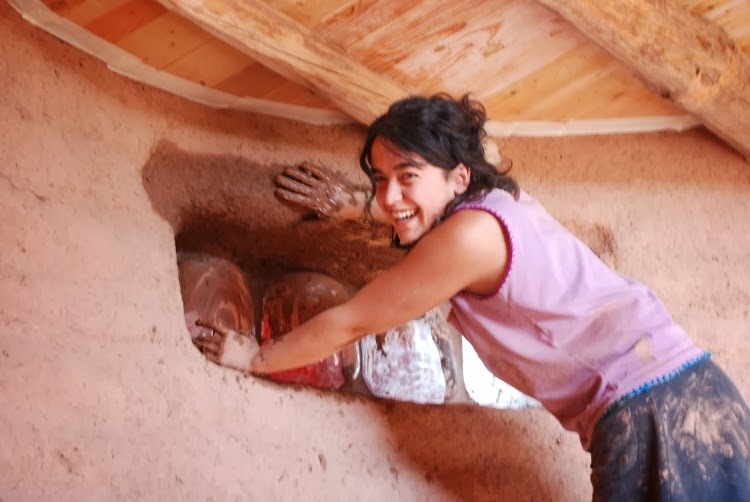 This is a common natural building strategy in mild, arid climates like the Mediterranean: south-facing cob walls absorb the sun's heat during the day, releasing it at night when the temperature drops. 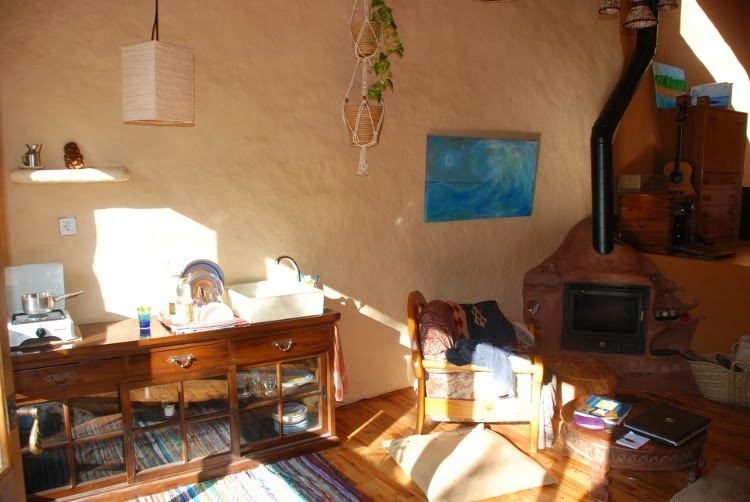 In this way south-facing cob walls can help regulate interior temperature changes. 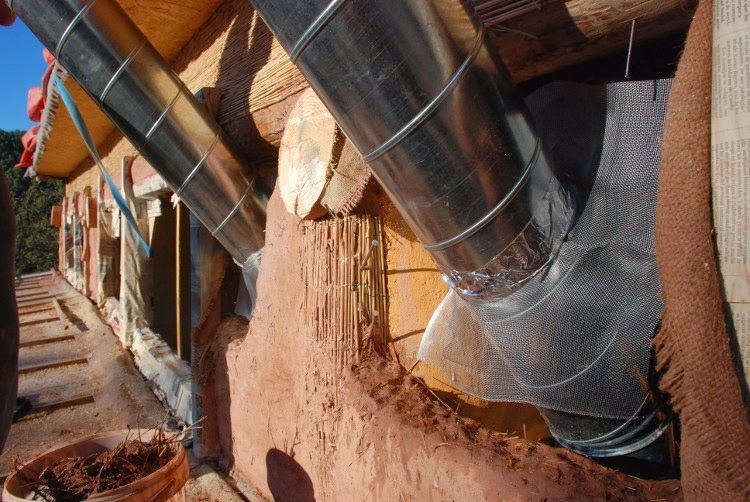 And although cob has a much worse insulation value than straw bale walls, the heat gained through the numerous south-facing windows more than compensates during the winter months, as the Cal Cases residents will tell you! 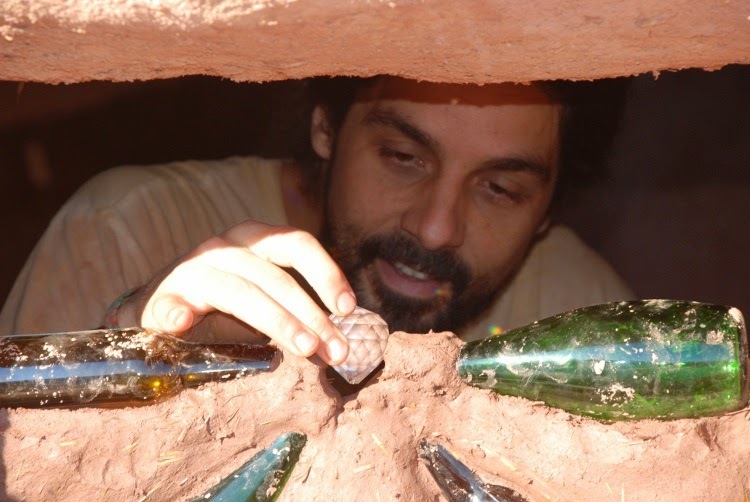 In addition to the salvaged doors and windows, glass bottles and other salvaged glass was used to make artistic colored points of light in the south-facing wall. 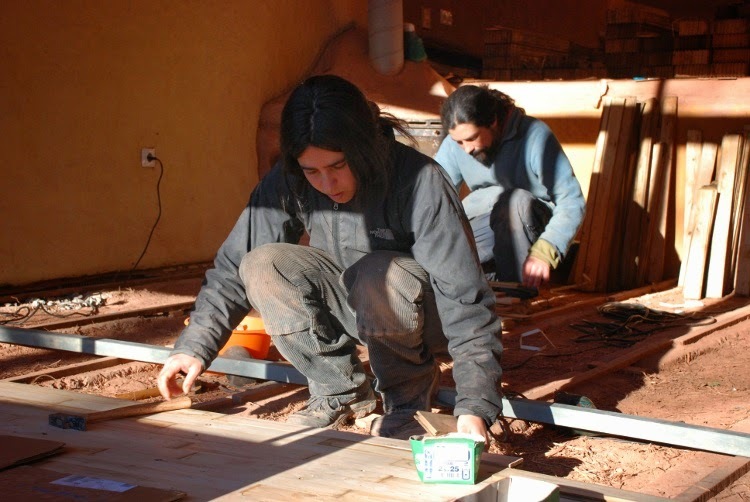 To prepare for the wooden floors, the floor was first covered in compacted gravel. This helps underfloor drainage by forming a capillary break and preventing moisture from traveling upwards into the floor. 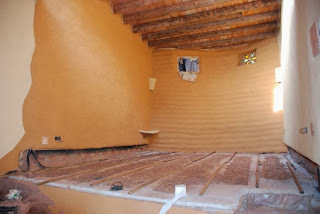 Then a vapor barrier was installed, and on top of this went a subfloor of lime and cob. 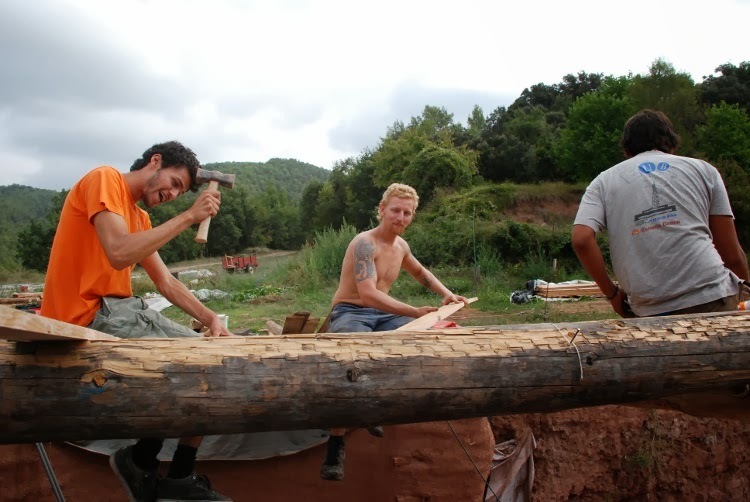 Lime was used to offer a firm surface for attaching wooden battens, to serve as points for attaching the wooden floorboards. 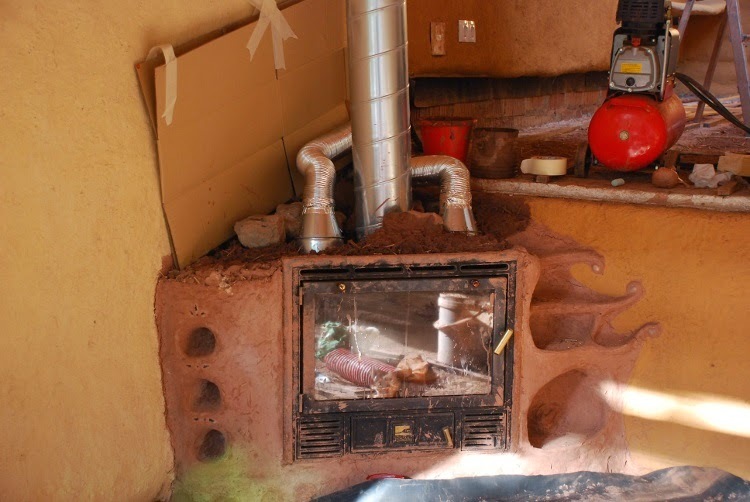 Thermal mass stoves were also built in each apartment at this time, using salvaged wood stoves and cob mixes of clay-rich subsoil and straw. 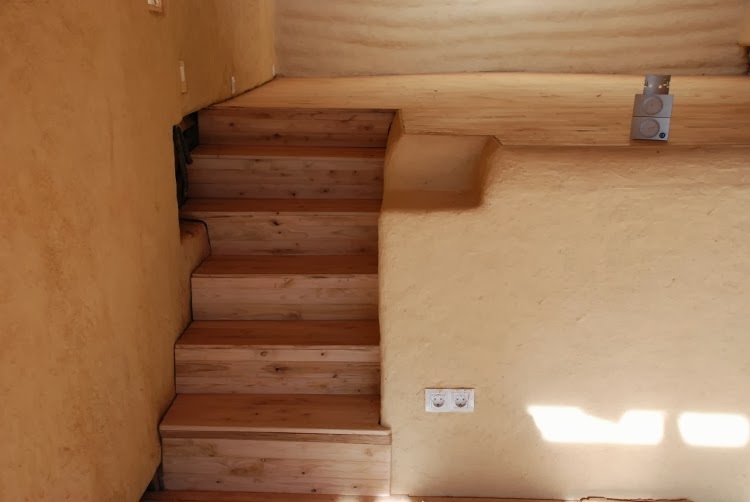 In the above photos you can see the wooden flooring going in, along with finishing details like stairs and wall outlets. 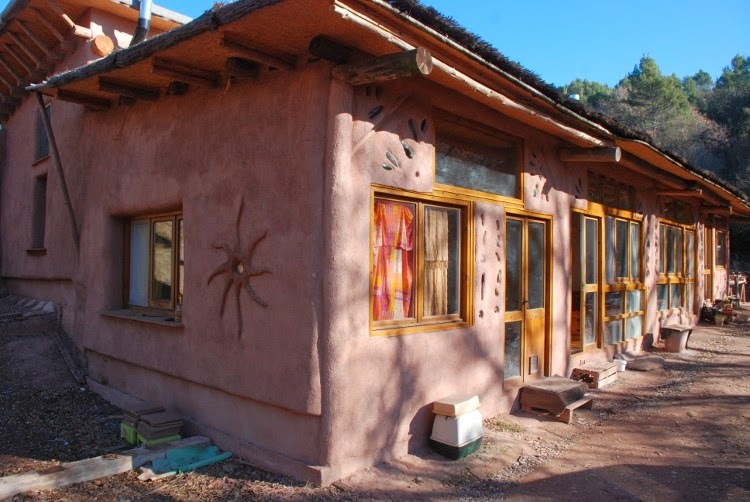 And at long last, the 4 straw bale apartments were complete! 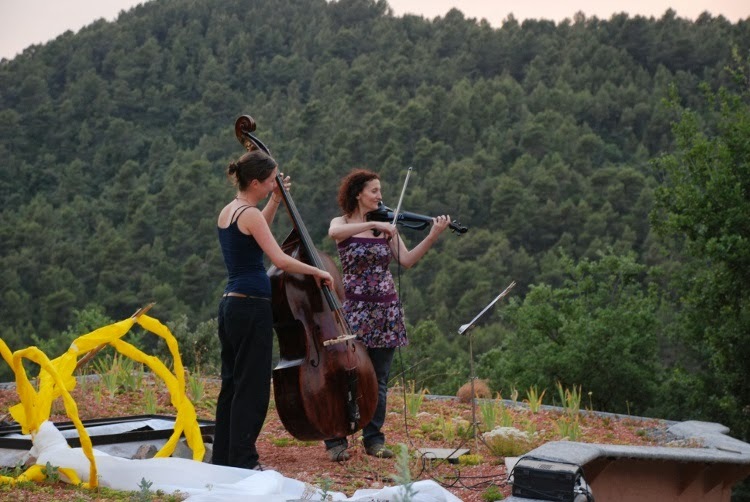 A housewarming party was held, complete with music performed by friends atop the green roof. With the Cal Cases community members moving into their new homes, they began to decorate and personalize the apartments. In the photos above, you can see a couple of the apartments have lofts under construction now. 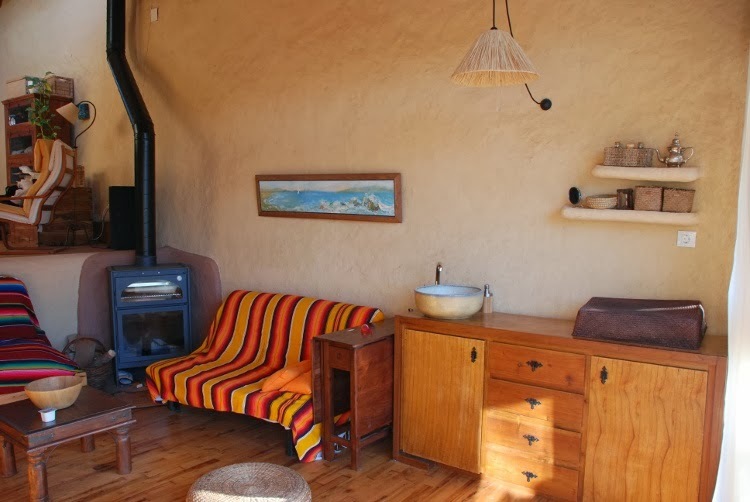 Wood stoves, some of them converted into thermal mass stoves, were installed in each apartment. Vessel sinks and small kitchen areas were also a popular idea. 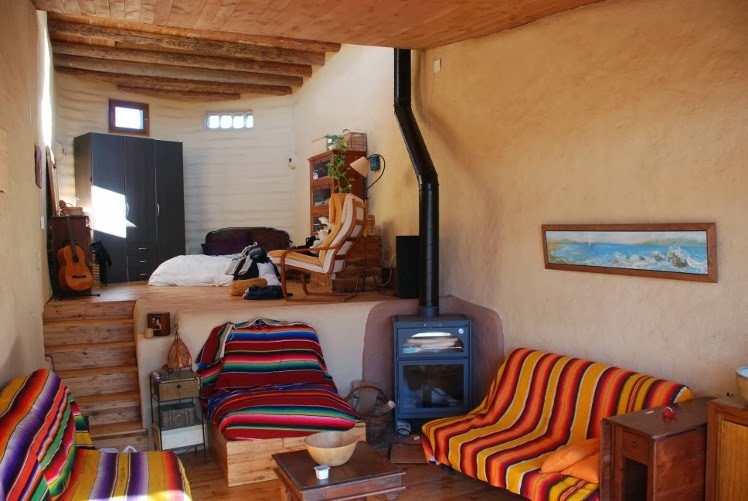 All in all, the 4 straw bale homes at Cal Cases were an ambitious and extremely rewarding project. We incorporated many different elements of natural building and efficient home design, and the result was a building that is beautiful, unique, inexpensive to build, and extremely efficient in terms of interior air quality and heating and cooling. 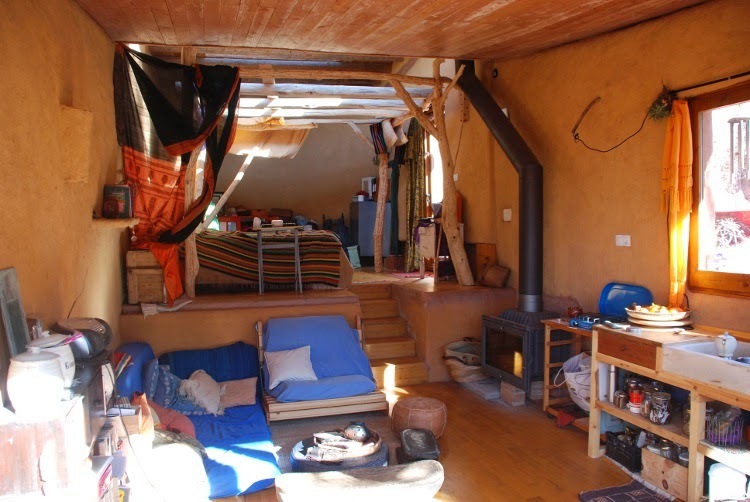 The presence of thermal mass on the interior walls in the form of 2 inches of earthen plastering, protected by the incredible insulation value of straw bale walls, means that in winter the building serves as a giant heat battery, soaking up heat from the sun or from the wood stoves inside and storing this heat within a super-insulated building. 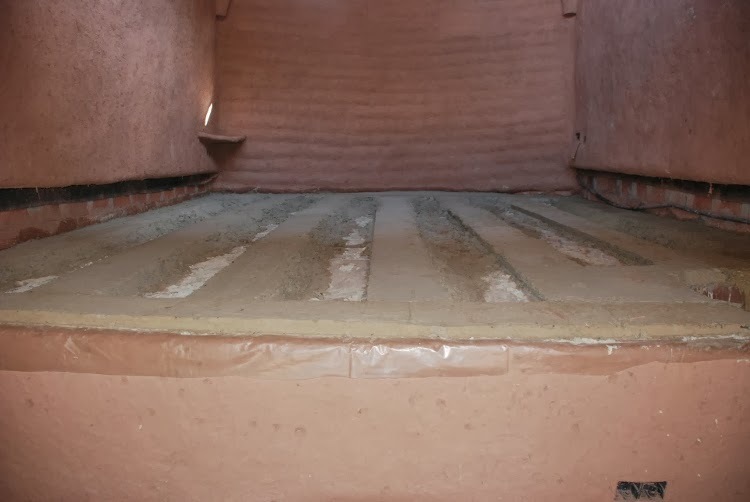 When the sun goes down, or the stove is shut off, this stored heat is slowly released into the room for hours and hours. Living and working with the Cal Cases community was a truly excellent experience. 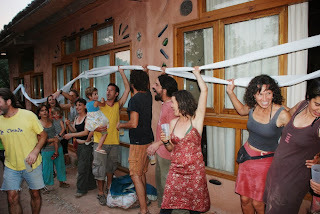 Words cannot describe the impression my time with them has had on me: to see an intentional community succeed to the level of Cal Cases, to live with a group so determined to live a style of life that is in harmony with their ideals, to feel the resulting happiness, love and generosity, the great natural wealth available to us all if we would only take an interest in it... these were the most valuable lessons of all that I learned at Cal Cases. 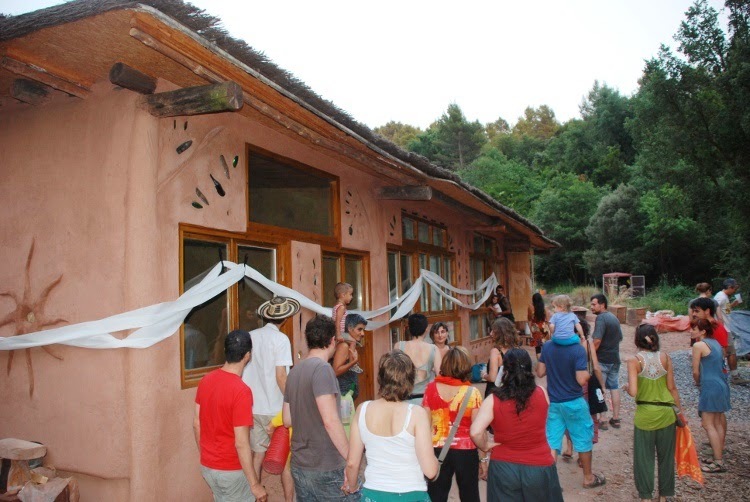 It was a great honor and lots of fun to help Cal Cases in the construction of their straw bale housing project. 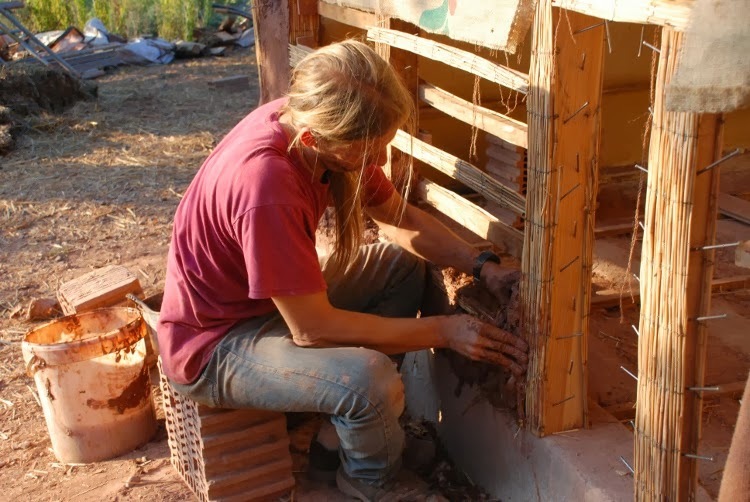 It makes me very happy to know that right now the Cal Cases community is alive and well, settled into their new, super-efficient straw bale homes.